Conflict of interest happens across everywhere as most of the time you don’t get what you want. You compromise with what you get as there is no other option. It could be with your parents, siblings, friends and so on when you were a kid. Later the same conflict happens in your workplace. You may want something but get something else. This definition is from an individual point of view. But as a company, they cannot afford to lose any project or business due to conflict of interest. Hence they make policy and make sure that employees do not bring in their personal views to disturb the goal of the organization. Therefore, the conflict of interest policy must be written which becomes an additional responsibility of the company. That’s the reason I decided to provide ready-made templates to help those individuals or company looking for making a conflict of interest template. These templates can be used for any specific purpose. 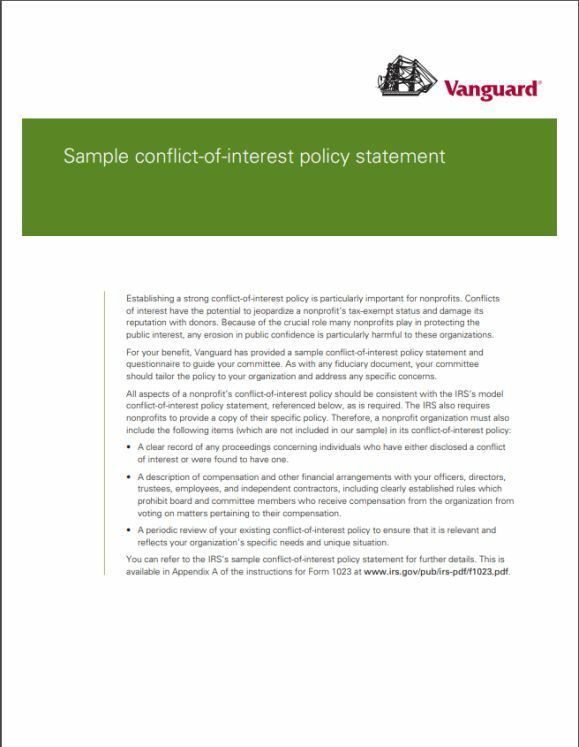 Just know more details about conflict of interest policy templates, how to prepare one, and the components included in it. You can have a fair idea to make one for future, but rest assured downloading from here will save your time and expenses. Lets deep dive to know more about conflict of interest policy. You must remember that making policy must have some basics to be followed as it is a document which defines many terms. Such policies must be designed in such a way it avoids any discrepancies. Keeping such things in mind let me brief you about the steps involved in preparing the conflict of interest policy. Conflict of interest policy must be well-defined and clear based on the particular purpose. It must be clear and to the point. It must focus on protecting the interest of the company or business and at the same time consider the people as well. No biased conflict of interest is allowed, and it may lead to controversies if prepared otherwise. Also, explicit clause mentioning is essential so that users will know the consequences of not abiding by the policy. At the same time, it needs to be prepared in such a way not threatening the people who must follow the policy. The following components must be included in the policy and let me explain one by one as to how to draft conflict of interest policy. Purpose: The purpose of the policy must be defined. The person who drafts it must keep in mind the nature of the job and how the conflict of interest of the associated individual will affect the job. This purpose must be identified and stated. This will undoubtedly inform the user to know why conflict of interest is not encouraged in a situation. Definition: This section must mention the person who is interested in the job to be done. That is the owner of the policy. This section will have the subsection called financial interest. Not only will the owner be the interested party but the stakeholders who have Therefore a mention of such people must be listed. Duties: Keep informed to the users to report the reasons for the conflict. The individual must be provided a chance to express their disagreement. Determine the existence of conflict: Once the discussion happens both parties together can evaluate the ways to resolve the conflict of interest for the mutual benefit of both the parties. Procedure: The procedure to resolve the conflict of interest will happen only when the party disclosed the reason for the conflict. Then the board members will discuss to take a route to address the issue. 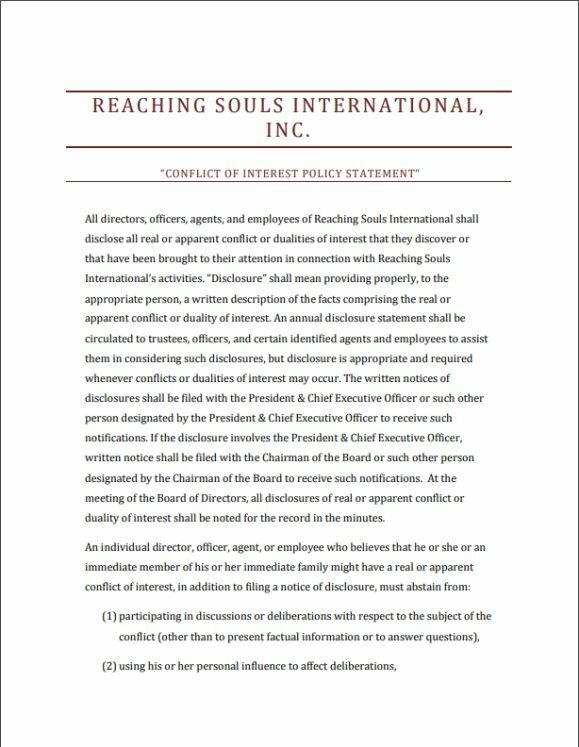 Violations: Upon discussion with the board the company will either favor the person or will inform of a breach when they feel that the reason for conflict of interest is not justifiable. Recordings: Every action and steps taken in addressing the conflict is recorded, and such details are listed in this component. 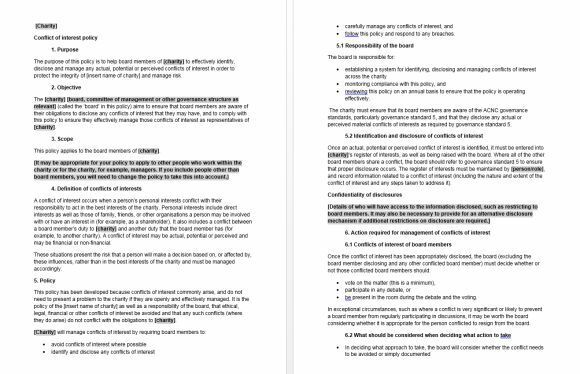 Annual Statement: Every person included in this policy will sign a statement and made sure that they understood the terms and agreed to abide by. Having said what must be included in the policy it is also essential to know the things that must be avoided in the conflict of interest policy. When making policy and seeking signature from the concerned person, it is the responsibility of the policymaker to avoid things like using the threatening terms. The policy must abide by the law, and it cannot be used as a weapon to intimidate any individual. It cannot mention terms that force an individual to disclose the reason for conflict. When published, the company must have a discussion, and terms like no rooms for review must not be included in the policy. Also, terms that will compare between individual must be strictly avoided in the policy. In a nutshell, it must be a policy that helps both company and individual to resolve conflict and not be a biased statement. Now, you can download any template of Sample Conflicts of Interest Policies from here posted under each subsection for your perusal. Also, get inspired to know why such a policy is made for each topic. 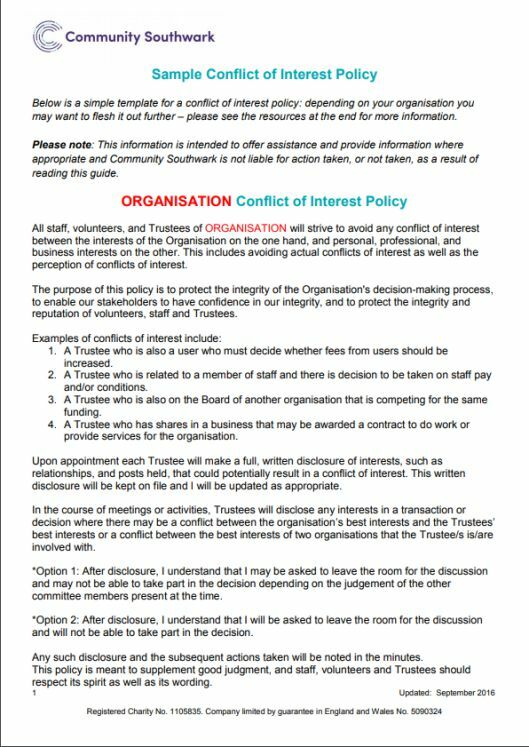 Board members cannot afford to have a conflict of interest with the company as they are part of the decision-making team and hence they must sign a conflict of interest policy. 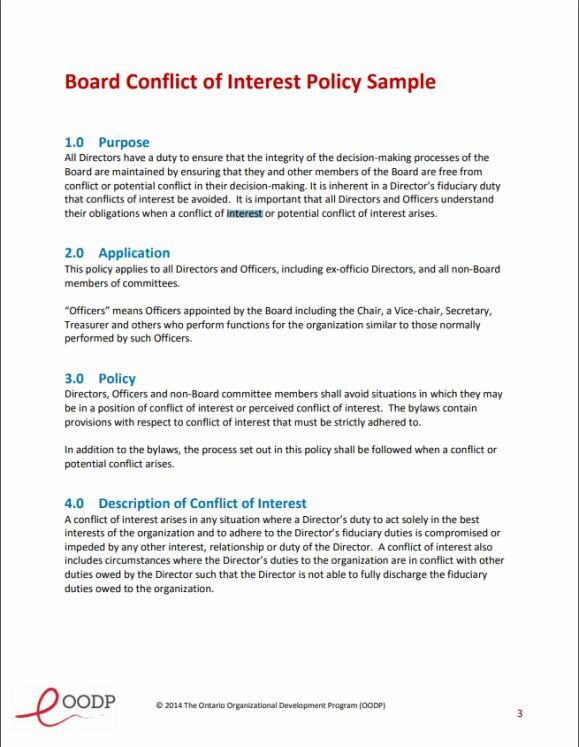 Under several situations conflict of interest arises for board members like finance, personal reasons, having a focus on other business interest, etc. The company must prepare the policy with the help of the company’s legal advisor and must obtain a signature at the time of taking the responsibility. All the board members must sign in this policy along with the new member added to make sure that everyone lies on the same platform. The template must have all clauses as mentioned in the component section. Use the sample to take help and edit necessary things to use for your business from the template given for your benefit. 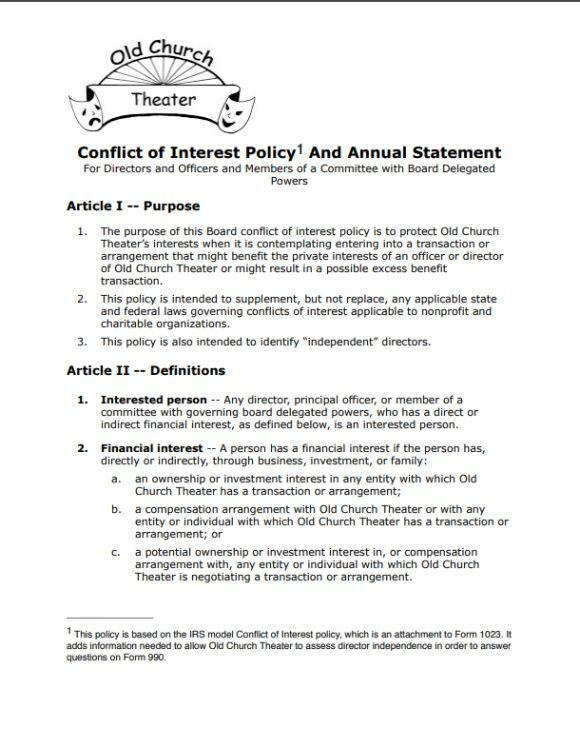 Why churches need conflict of interest policy? 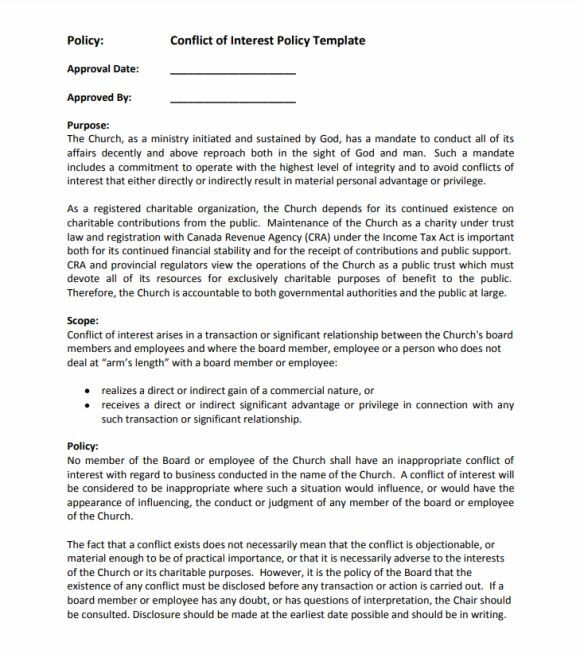 Per the survey conducted by the Evangelical Council the need for conflict of interest policy for churches are required due to the reason that they are not entirely equipped and to handle the disputes. Activities, scope, and the relationship must be covered. Procedures and the standards used to implement the policy must be mentioned. Not for profit work must be carried out without any conflict of interest. More than paid work nonprofit organizations must take responsibility to achieve a goal without having any conflict in thoughts. Hence make policy with the checklist and work towards reaching an objective. Make sure the interest of each in the board is assessed before making a policy. Find out the need for offering training about the conflict of interest. Finally, ensure to take signature from all in the conflict of interest policy document. 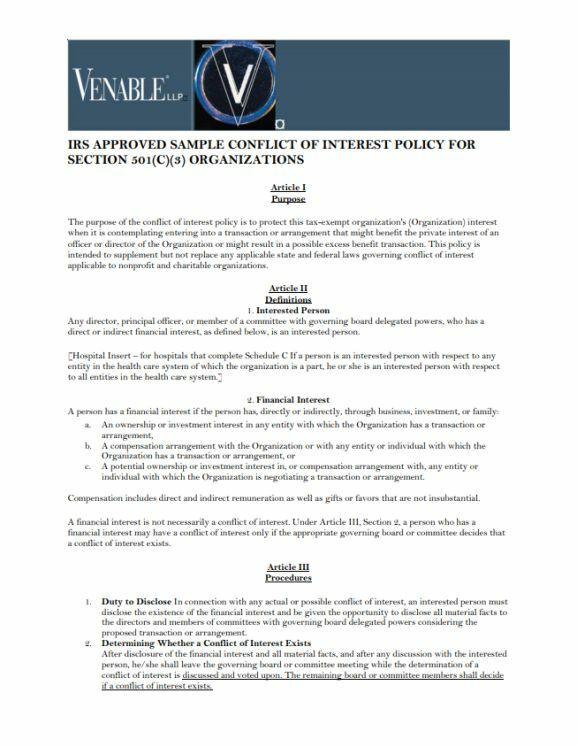 You can also use Conflict Of Interest Policy Template Charity if you run an entire charity organization. The non-profit, tax-exempt organization serves for promoting a specific community well. However, sometimes those involved in the organization can use their influence to earn a personal profit at the cost of the charitable organization. This is called a conflict of interest. Applying a policy to handle a disagreement appropriately can help ensure that your organization complies with the IRS (Internal Revenue Services). You can find example template that will describe the best way to make a conflict of interest. This can be used by employers, directors, board members, etc. Conflict arises in every situation including office, charity work, non-profit and many more. When more than one individual is involved, then conflict happens due to the varying interest. But it is essential to design a conflict of interest policy before starting any work that consists of this individual. One must come to a common platform to achieve a goal and conflict of interest should not hinder in the process. Hence use this example template to draft a conflict for your business. The need for Conflict of Interest Policy Statement in various situations is to make transparent procedures. This will help business to deal with the actual situation when conflicts of interest arise. Conflict of interest policy statement is required when there is a financial disagreement, personal clashes, speaker conflict, etc. Every purpose must have an explanation defined, and these potential conflicts can be handled. 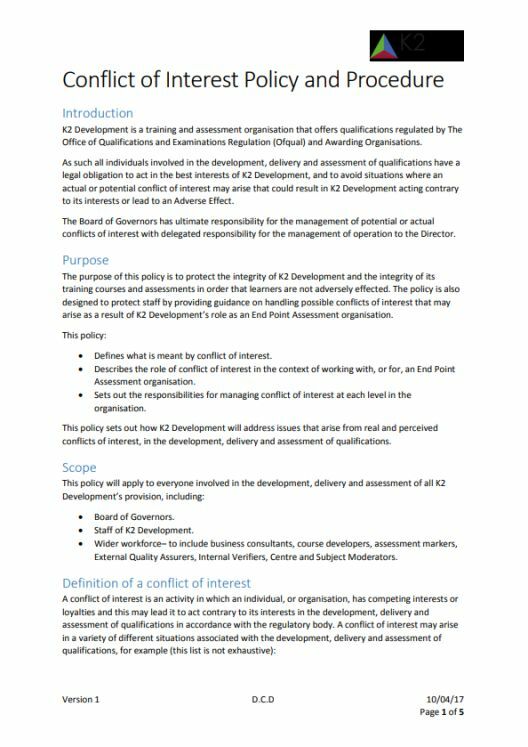 The purpose of the conflict of interest policy for training providers is to look after the integrity of the training organization and the reliability of its courses and evaluations. This will help the learners to get rid of any adverse situation due to the lack of interest of the trainers. The policy also protects the staff by giving them proper direction to handle the conflict of interest that arises if any. 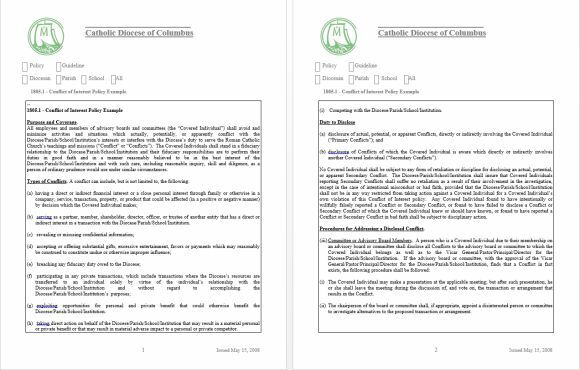 Apart from these templates, you will always require templates in the following three sections which do not need a great explanation, and the name itself is self-explanatory. Every business small or big must define a conflict of interest policy for the well being of the employees and the industry. Feel free to use any template and draft your conflict of interest in a specific manner to safeguard the importance of your business.